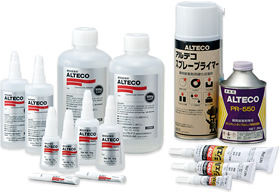 Alteco Cyanoacrylate Adhesives | ALTECO INC.
From handicrafts of artisans to cutting-edge manufacturing, Alteco cyanoacrylate adhesives have been widely utilized. Our cyanoacrylate adhesives are designed to cure firmly in seconds by reacting to minute traces of moisture on the surface of the material to be bonded at room temperature. Using Alteco primer and accelerator properly expands the scope of uses and enhances the potential of cyanoacrylate adhesives. ●Above is typical grade only. We may select grades available upon consultation. ●Color additives are also available. Using Alteco accelerator with a cyanoacrylate adhesive improves curing time, furthermore, facilitates bonding under harsh conditions. The accelerators also prevent the blooming – the white stain caused by redundant adhesive. 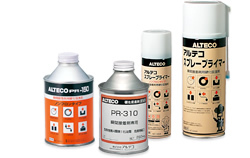 Applying Alteco primer in advance enables the adhering of hard-to-bond materials such as Polyethylene, Polypropylene, silicone rubber and various engineering plastics. *If you have problems of any hard-to-bond materials in production lines, just feel free to contact us by email or phone call. We will check the applicability of our primers and show you the solution. E-mail/Call us. ALTECO sales engineer will contact you. With close communication with the customers, ALTECO will select or make the best product for your application and devices. ALTECO adhesive professionals’ quick and right support will readily solve your bonding problems. We are happy to start business with you from small quantity. Please feel free to contact us.